Trax’s projects to support communities to develop sustainable livelihoods in Northern Ghana depend on the expertise of our staff. We want to celebrate the successes, achievements, and dedication of our staff, without whom Trax could not help reduce poverty and increase food security in vulnerable communities. In this post we are celebrating the work and dedication of Madam Disiwani Laar. This year marks 20 years of Disiwani’s dedicated service to the farming communities in Bunkpurugu-Yunyoo District, in Northern Region, as part of Trax’s staff team. 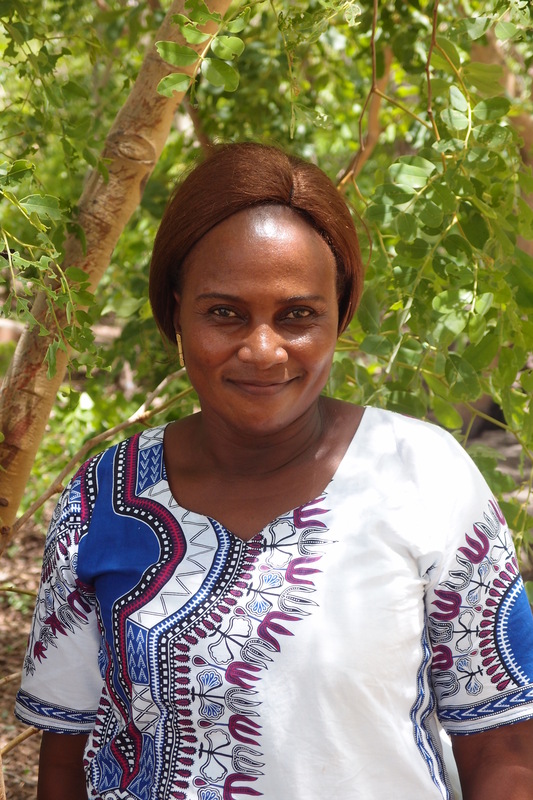 Madam Disiwani Laar – Senior Field Officer at Trax’s office in Bunkpurugu, Northern Region. In the two decades Disiwani has worked for Trax, she has seen many other staff come and go, changes in the structure and facilitation of our programmes, new project activities, and changes in funding partnerships and local collaborations. When Disiwani joined Trax in 1997 she was employed as a Project Assistant, before working as a Income Generating Activities Assistant. Through these roles she developed vast expertise working at the grassroots level, facilitating participatory processes and supporting sustainable agricultural livelihoods. She has since been working as a Field Officer and is now the Senior Field Officer located at the Trax office in Bunkpurugu. Disiwani visits a farm in Mozio community which is practicing agroecology. 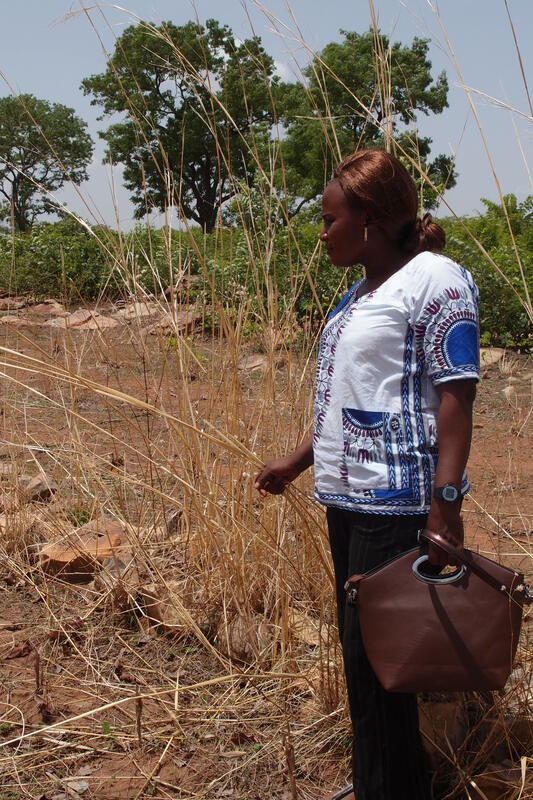 In her 20 years working for Trax, Disi (as she is commonly known) has supported 20 communities or sub-communities in and around Bunkpurugu, working with thousands of farmers living in poverty. She is well known and very highly regarded in the local area. The farming communities she has supported to establish sustainable agricultural livelihoods through an agroecological approach to farming report increased yield, restoration of land which was previously deforested and degraded, increased income from diversified sustainable livehood sources, and stronger unity among the communities. The life changing poverty reduction, increased food security, and community self-reliance created through these changes deserve recognition and celebration. 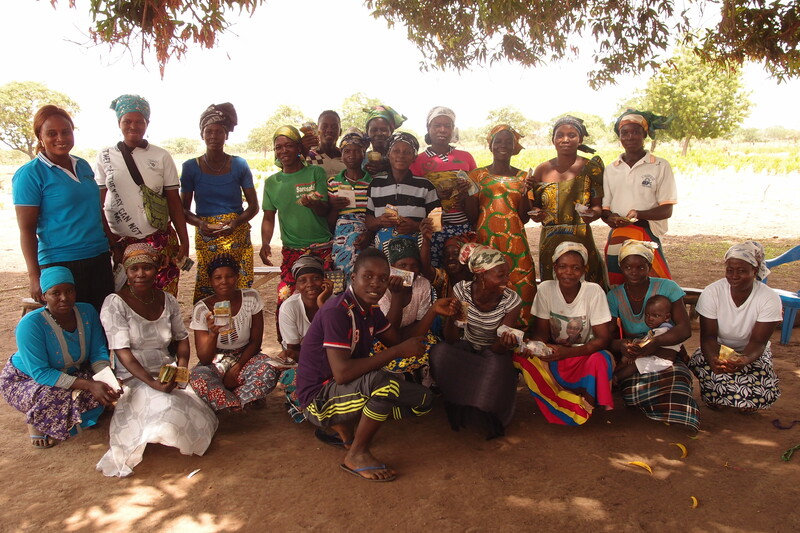 Disiwani has clearly achieved many positive outcomes for rural communities living in Northern Ghana. Disiwani says that the agroecological soil and water conservation practices which Trax facilitate are those which she has observed to make the biggest difference towards sustainable agricultural livelihoods in farming communities. 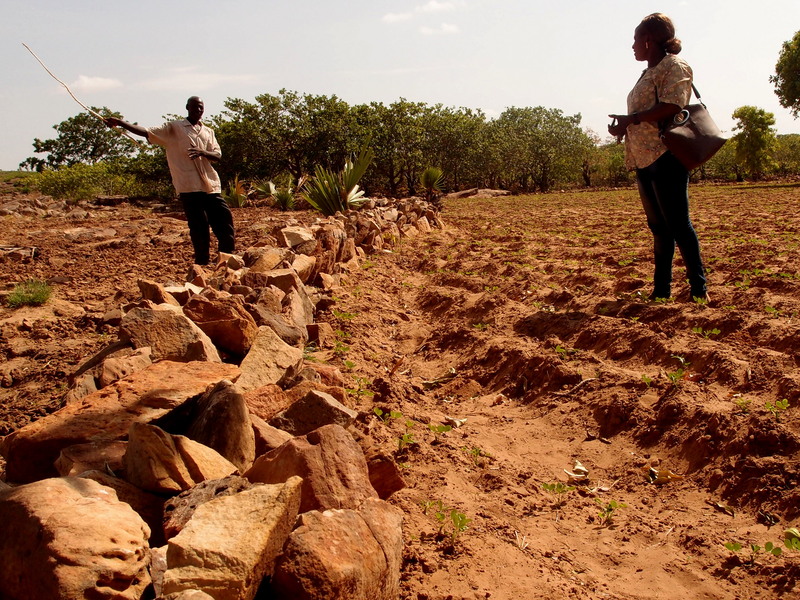 In particular, she recognises the important role of contour identification and construction of stone bunds, and compost production using crop residue and farmyard manure, to have the greatest positive impact for crop yields and sustainable farming. Disiwani (back left) celebrates with a VSLA group at their first share out in Yunyoo. Disiwani is particularly interested in gender equality and women’s empowerment, as has worked often with women’s farmer groups. In recent years she has been supporting numerous women’s groups to establish Village Savings and Loans Associations (VSLA) across the Bunkpurugu-Yunyoo District. VSLAs are very popular in the area and Disiwani is now under much demand to support additional groups and communities to establish VSLAs. As we have shared elsewhere, since the beginning of 2016 Trax has been facing significant financial shortfall when our primary funding source ended at short notice. Unfortunately, this has left no direct project funding to support ongoing activities in Bunkpurugu-Yunyoo District. As such, Disiwani, and other field staff, have been unpaid for 10 months, a move which was the most difficult Trax has had to take in it’s 28 years of opperation. 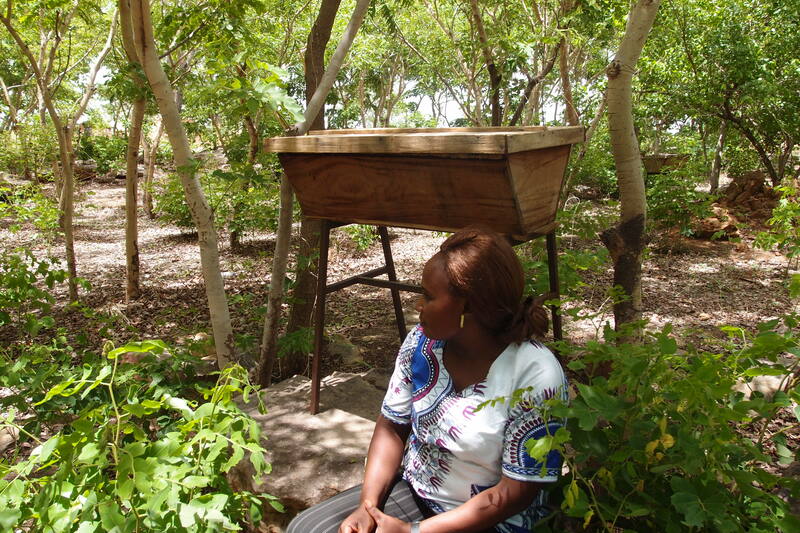 Disiwani inspects bee hives installed as part of a Trax project in partnership with Tree Aid. The bee hives have been colonised. Despite this challenging situation, throughout the past 10 months Disiwani, and other field staff, have continued to work voluntarily. This demonstrates the high level of commitment and dedication which Disiwani holds for the farmers and communities she supports. It is this dedication which make Disiwani and all of the Trax staff team so valuable in our efforts to support a sustainable life for vulnerable communities. Outside of working for Trax, Disiwani is a farmer herself and is specialised in rearing livestock. At present she keeps goats, pigs, and fowls. During the past 10 months when Disi has not been able to receive her salary from Trax, she has relied on income generation from her livestock in order to continue to support the many people in her household. A farmer tells Disiwani about the activities he has undertaken to prepare the land for the upcoming farming season. Here he shows her his recently-restored stone bunds. In recent months and throughout the past 20 years, Disiwani has contributed her expertise to the development of Trax project activities and the organisation as a whole. We value and appreciate her work everyday, as do the communities she is so dedicated to. In this year marking her 20 years of dedicated service to Trax, we want to take this opportunity to celebrate her extensive achievements and successes during this time and thank her for continuing to support Trax’s work.We hope you will join us in thanking and congratulating Disiwani. Disiwani Laar, thank you. Congratulations on achieving 20 years of service for Trax. We look forward to many years to come working alongside you with a more positive and supportive funding environment. This entry was posted in Agriculture, Food Security, Funding, Village Savings and Loans Associations and tagged Bunkpurugu-Yunyoo District, Dedication and commitment, Disiwani Laar, Staff profile. Bookmark the permalink.